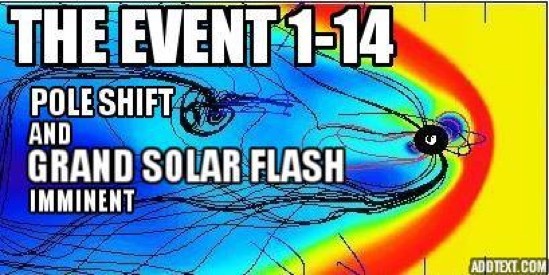 ON 12:21 TESTING WAS UNDERWAY FOR THE GRAND SOLAR FLASH AS EARTH EXPERIENCED AN AMAZING WHITE-OUT OF 40 HERTZ BLINDING WHITE 5D GAMMA LIGHT DATA! DURING THIS INITIAL ASCENSION PHASE A MAJOR DNA UPGRADE OCCURRED FOR ALL STARSEEDS ON EARTH! NOW A MAJOR OPERATION IS UNDERWAY BY PLEIADIAN LIGHT FORCES TO FINALIZE THE GRAND SOLAR FLASH WHICH CAUSES THE QUANTUM JUMP TO THE FIFTH DIMENSION! ON 1-14 A LARGE CACHE OF ETHERIC DATA CAME IN FROM PLEIADIAN LIGHT FORCES. THERE IS SO MUCH DATA IT WILL TAKE 24 HOURS TO FULLY PROCESS IT ALL! THE DATA HAS TO DO WITH PLEIADIAN LIGHT FORCES TECHNOLOGY BEING USED TO TRIGGER THE COLLECTIVE ASCENSION OF 4.5 BILLION STARSEEDS STATIONED ON EARTH TO THE FIFTH DENSITY! THIS TECHNOLOGY INVOLVES SIMPLE PHYSICS BUT IT IS JUST SIZED UP TO GALACTIC SCALE. 1. THE PLEIADIAN FLAGSHIP NIBIRU (5 TIMES THE SIZE OF EARTH) IS CREATING SUCH A MAGNIFICENT MAGNETIC PULL ON PLANET EARTH, IT IS CAUSING A COMPLETE MAGNETIC POLE REVERSAL! THE MAGNETIC FIELD OF THE EARTH IS BEING STRETCHED LIKE A RUBBER BAND AT THIS HOUR AND THIS MAGNETIC POLE FLIP IS IMMINENT! THIS IS AN INTENTIONAL EFFORT OF BENEVOLENT BEINGS TO TOTALLY FLIP THIS REALM FROM 3D TO 5D! 2. A GIANT CHARGE OF AKASHIC PLASMA FROM THE CENTRAL SUN IS BEING TRANSFERRED AND BUILT UP INSIDE THIS HUGE PLEIADIAN TANKER AND MEGA SHIP (NIBIRU) WHICH WILL BE DEFLECTED OFF THE EARTH'S SUN AND BEAMED TOWARDS THE EARTH! THIS COSMIC ARC OF BLINDING WHITE LIGHT IS KNOWN AS THE GRAND SOLAR FLASH AND WILL BE AN EMP OF MAGNIFICENT PROPORTIONS! THE SOLAR FLASH SUPER CAPACITOR CHARGE WILL BE LET LOOSE AT ANY MOMENT NOW AND WILL BE PERFECTLY TIMED WITH THE MAGNETIC POLE FLIP AND THIS IS WHAT IS REQUIRED TO SHIFT FROM THIRD DENSITY TO 5D! DO NOT BE IN ANY FEAR BECAUSE THIS IS ALL PART OF A GRAND DIVINE PLAN TO FULLY TRIGGER THE ASCENSION OF THE ANGELIC BEINGS NOW-HERE ON EARTH IN HUMAN BODIES! AS INTENSE AS IT ALL SOUNDS, ALL THAT YOU WILL EXPERIENCE IS BEING IN THIS LOW-VIBRATIONAL REALM ONE MOMENT AND THEN BEING IN THE NEXT HIGHEST MORE BEAUTIFUL VERSION THE NEXT! THERE IS A CODED DATE IN THIS DATA WHICH WILL BE FORTHCOMING! ALL WE CAN SAY NOW IS ON OR BEFORE 1-21. KNOW THAT ALL IS WELL AND STEADY AS WE PROCEED! REJOICE AS THE GREAT TIME IS AT HAND!